Welcome to the Americas Best Value Inn of San Antonio/ TX. We are located near the heart of Lackland AFB just outside their main gate. Our property has 28 beautifully furnished guest rooms featuring cable TV w/ HBO/ iron/ free local calls and long distance calls in the US/ Canada and Puerto Rico/ microwave/ mini-fridge/Internet access/hairdryer and more. Complimentary continental breakfast is served fresh every morning to help start your day off right. Additionally/ our Inn is located less than 10 minutes from San Antonios beautiful downtown/ the Henry B. Gonzales Convention Center/ Riverwalk/ the Alamo/ and Sea World. San Antonio International Airport and Six Flags Fiesta Texas is a short 15 minutes away. 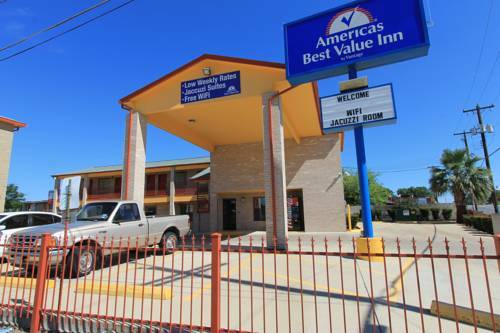 Come relax and enjoy the value at the Americas Best Value Inn near Lackland AFB. Property located just outside the main gate of Lackland Air Force Base approximately 7 miles from San Antonio nearby Loop 410 and Hwy 90.